The sixteenth century was a watershed in Egyptian his- tory. After being the center of powerful Islamic empires for centuries, Egypt was conquered in 1517 and made an outlying province of the Ottoman Empire. This study illuminates aspects of Egypt's social, intellectual, and religious life in the sixteenth century, as described by the Egyptian Sufi 'Abd al-Wahhb al-Sha'rn, one of the last original writers before cultural decadence permeated the Arab world in the late Middle Ages. A prominent social commentator, Sha'rn reflected the intense Turkish-Egyptian struggle of the period and provided a vivid and intimate account of the Muslim world during the later medieval stage. 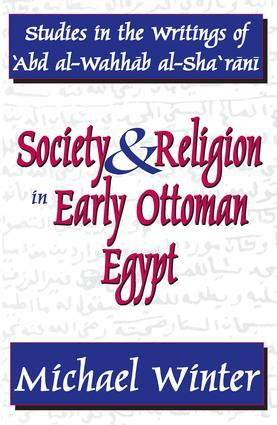 Now in paperback, Society and Religion in Early Ottoman Egypt attempts to give a comprehensive analysis of Shaærani writings.